For centuries, India's strict caste system prohibited many Hindus from worshipping their gods in a public way simply because lower caste Hindus could not afford the services of a brahmin (a priest). Yet Huyler, co-curator of the Puja: Expressions of Hindu Devotion exhibition at the Smithsonian's Arthur M. Sackler Gallery, notes that these lower caste families and individuals found many ways to worship and to keep alive devotion to their own religion. In what is sure to become an enduring work, the author provides descriptions of the many devotional rituals that occupy Hindus as they seek darshan, seeing and being seen by God. In an opening chapter, Huyler explains the major concepts of Hindu devotions: puja, ""a ceremonial act of showing reverence to a God or Goddess through invocation, prayer, song, and ritual""; dharma, ""the supreme law of righteousness""; karma, ""the doctrine of absolute responsibility""; varna, the caste system; Brahmanas, priests and their families. Using stories and photographs, Huyler describes the elements of public worship in a Hindu temple, the rituals accompanying worship in the home, the practices surrounding community festivals, processions that honor specific deities and the coming-of-age ceremonies that mark adolescence and old age. Photos grace every page: 200 in all, gorgeous full-color depictions of temples, household shrines, statuary of deities, sacred sites such as the Ganges River and people engaged in particular ritual activities and processions. 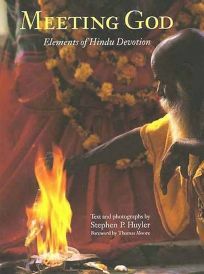 Huyler's riveting prose and lavish photos bring Hinduism and its practices to life in all their richness and diversity. (Sept.) FYI: The book will accompany an exhibition that opens at the Houston Museum of Natural Science in fall 1999.